I live in Two Rivers with my husband of 16 years and our family of critters. 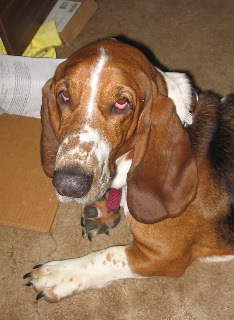 We have three basset hounds in the house, one cat, one fish tank (several geriatric fish! 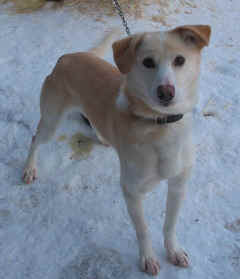 ), and usually outside there is an assortment of sled dogs, both fosters and home-grown, plus a blind pony and her seeing-eye cow, and a small herd of Nigerian Dwarf goats. Oh, and about a half dozen rescue chickens too. I am a lifetime member of the Alaska Dog Mushers Association here in Fairbanks and have raced and organized many great events. 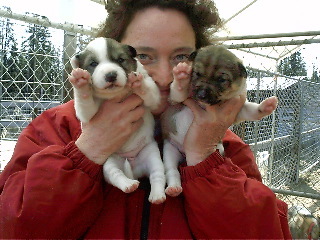 I am a founder of the Second Chance League - a sled dog training and evaluation program that rescues dogs from the Fairbanks North Star Borough Animal Shelter and rehomes them appropriately. I do petting zoos for kids and adults and have trained many beginners in the sport of dog mushing. I was the coach for the blind musher Loy MacIver for seven years before she retired from racing. What is your primary sled dog activity or area of interest? I'm a sprint musher by training, but I'm learning to branch out in my mushing experiences! 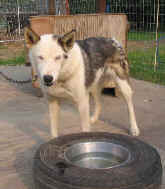 How long have you been involved with sled dogs? I got involved with ADMA first as a radio announcer during race coverage. I joined the club in order to learn more about the mushers and ended up borrowing an assortment of dogs and racing them with my Golden Retriever back in the 1980s. 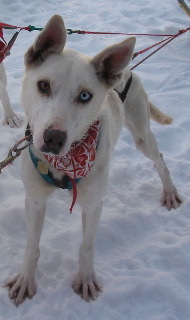 I started out racing in the 5-dog class because that was the smallest class they offered at the time and I graduated down to 4-dogs and then skijoring! Since then I've come back up and now hope to race an all white team of shelter dogs in the 8-dog class. I trained puppies for Kathy Frost and Lloyd Lowry for many years, and then assisted Kathy with training the main team, and finally took over racing for their kennel when they retired and before they sold most of the best dogs. I still have about a half dozen Frost-Lowry dogs and they are the backbone of my training program, helping me to train my various foster dogs. Another of my mentors has been Val Mackler. She turned 80 years old this fall and she's still going strong! Most of her dogs are as old as she is and she spends a lot of time and energy helping them live comfortably. What size kennel do you operate? and then I got a lab. 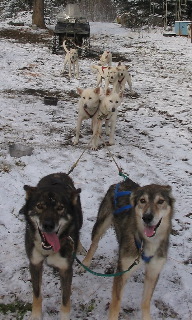 I boarded a few sled dogs for other people, and Id borrow house pets and sled dogs both in order to put together a team to race. 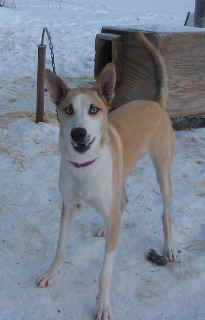 It wasn't until I was married that my husband brought home our first official sled dog. Seems a friend of his at work had a daughter that wanted to play volleyball rather than dog mush, so theyd sold all her dogs, but nobody seemed to want this one, and he was lonely all alone out in their yard. So Jarvis came to Daisy Acres. Turns out he was a littermate to Roxy Wrights famous ONAC leader Drummer! But I didn't know that at the time, I just thought he was a goofy sled dog. I neutered him and loved him until he died at age 15 this fall. About ten years ago Kathy and Lloyd offered to let me train some of their pups, but I didn't have any leaders. They also gave me a little red dog named Cyclops. I spent a lot of time teaching Jarvis and Cyclops to line out and lead! The next year Kathy gave me a retired leader named Mink. Mink was an amazing dog. (Aren't they all?) Well, that started it. A few other people gave me some dogs too. What type of tether/bowl system do you use? I have several pens and I keep some of my dogs in them loose, but I dont like what happens to my feeding program when I have multiple dogs loose in the same pen. Unless I tether the dogs for feeding I cant regulate the rations properly. Most of my dogs are on chains with rebar swivels. My husband is an airplane mechanic and he brings home used airplane tires and they hold a 5-quart stainless steel dish just perfectly, so I use these tires as bowl holders. For the dogs who pick the dish up out of the tire and hide it, I had my husband clamp the suckers in! No bowl tipping in THIS yard! What are the most important considerations in housing sled dogs? I think the most important consideration in having sled dogs is to pay attention to them and to spend time with them. Put your hands on the dogs as often as you can. Feel them! They love the attention, but its also important that you notice stuff before it gets out of hand. Give us an overview of your feeding program. Im sponsored by ColdSpot Feeds so I feed National Dog Food, but I mix it with Annamaet dog food because I think that is one of the best commercial dog foods around. I just cant afford to feed it straight! I've also been known to mix other brands of kibble into my ration. I've fed Red Paw, Blackwoods, and Iams. I water dogs in the morning, and feed and then water again at night. My ladle holds three cups of liquid. Im thinking I should get a bigger one because six cups of water a day per dog is not enough. Summarize your basic kennel management style. I heard Tim White explain his kennel management style as purposefully random. Mine is more accidentally random. I dont feed at the same time every day. Maybe thats bad for the dogs, but thats life at Daisy Acres! I try to feed early the day before a race, and I water extra on race days. to a certain extent. They need consistency, and I love them consistently, but I mix it up in terms of how I handle them and what I do with them in order to better evaluate their temperaments and abilities. I dont have a lot of rules. In fact, my kennel has two universal rules and thats pretty much it. This one is a little bit harder to enforce. But the basic premise is that there is only one of me and I cant be there for everybody all the time. I like to invite other humans out to play and share in both the work and the fun. I also think this is really good for the dogs and I often get to see new and different sides to their character watching them respond to a different person. What breed(s) do you work with? I've trained shelties, poodles, bassets, pointers, retrievers, a Saint Bernard mix, and even an air-head-dale to pull in harness! Mostly I just work with huskies now, and my goal is to develop a team of all-white shelter dogs and race them in sprint races around Alaska in order to promote shelter dogs. What physical characteristics do you look for in your dogs? I agree with John Schandelmeier that any dog can be trained to pull. Id like more people to work with what they have rather than throw it away and get something else. We live in a society that promotes disposability more and more and I think the dogs suffer because of this. If youre not doing as well at the races as youd like, please dont blame the dogs! Change yourself first and see if you cant fix the problem that way. What mental or emotional attributes do you require in your dogs? I personally like happy dogs. What I've discovered is that there is a happy dog inside even that dog that cowers or growls at me. And sometimes finding that happy dog and helping it blossom out and up is more rewarding than starting with the no-brainer, already-there dog. On the other hand, there is nothing quite so wonderful as smelling rancid puppy breath and cuddling a newborn mewling grub of a pup and then watching and guiding and molding that little being into a happy dog that can read your mind and do your bidding without you having to even think about it. Tell us about an all time favorite dog or two. I also think that every critter in our lives is there for a reason. When I was a kid I was drawn to animals and really didn't like people much. As I've grown up the creatures have taught me how to interact with people better. Im learning to cut humans as much slack as I've cut the critters in my life. Somehow it just seems logical and necessary that animals are the way they are, but Id always been stumped by: stupid people. I've learned a lot from each and every sled dog I've known, and it would take a thousand pages to tell you about them all! But I bet if you took a moment and did a mental inventory, youd find that you had learned a thing or two from your dogs too! If not, I venture youre driving a snow machine. What criteria do you use for selecting breeding stock? I dont breed dogs anymore. I got too depressed seeing all the dogs they destroy at our local shelter. There are WAY too many dogs (and cats!) on this planet already. I didn't want to add to the mess. Every dog may not be perfectly suited to what YOU want to do. Well, then DONT make any more of them! If you cant use the ones you already have for heavens sakestop the madness! And DONT give away an intact animal to ANYBODY. You are responsible not just for that dog, but for all the potential progeny of that dog for the rest of its life. At least thats the way I see it. At what point do you decide a youngster is likely to make it in your team?  Another friend turned me on to a novel concept. Instead of expecting the dogs to conform to me, Im learning to conform to my dogs. Mushing is a team sportand conformity pays! But there is only one winner in any race and if all of us are expecting that brass ring there will be a lot of disappointment on race day. So I race for fun. Nobody can take that away from me. I appreciate the timers being there. I love having a turn-around marshal in case of trouble and to say hi to just for fun. I know going into the race that I'll likely finish at the back of the pack. But if my dogs and I learn something and work together well, then I go home happy. By the way, the dogs gauge winning off of YOUR attitude. Dont sour them on racing! I LOVE to train dogs! I find it rather odd that not everybody gets it the same way I do. Read any and every training book you can find. Somewhere out there is a trainer that speaks your language. I personally recommend: Bones Would Rain From the Sky by Suzanne Clothier. Its got nothing to do with dog mushing and everything to do with connecting with your dog. That connection is what makes it all work. Dog mushing is so cool because the connection is within a whole group...that team spirit thing really exists and it is very important. My training goal is to have fun, and like I said, Id like to race a team of all-white shelter dogs in the 8-dog sprint classes here in Alaska. But that may take another year or two, some of my dogs are pretty young and I dont have enough white ones yet. What do you consider most important to accomplish in training? If youre not having fun, why are you mushing? Yes, winning takes perseverance and hard work. Yes, sometimes you'll need to go out there and train when youd really rather not. But be careful. If you spend more time resenting the work and pushing yourself and your dogs beyond what is fun, maybe you should rethink the plan. Some dogs accept being pushed further than others. And some dogs have more to give than others. I find, generally, that the dogs give me everything they have. Dogs are pretty honest and upfront. Its too bad we can be more like them! What is the most indispensable training equipment you use? On sleds, I practice a lot with smaller teams, that gives more of my dogs training in lead and it builds my confidence and sets the precedence of control. When I move into bigger teams I design the dog team in my favor. I run dogs I trust, on trails that are known. I try not to let things get out of control because that is when the dogs lose faith in me. Once that happens other stuff can go wrong in a hurry. I try never to run the same exact trail twice. I live in Two Rivers on the best gee-haw leader training trails on the planet! I can choose up to 17 directional choices in a 4-mile run from my yard. I pass by several other kennels, horse paddocks, loose dogs and often pass other teams or skiers or snowmachiners and regular vehicles too. Most folks in this neighborhood are courteous to dog teams on the road and on the trails. How do you choose which races to enter? Im spoiled. I live in the dog mushing capitol of the world and I have access to the greatest training trails and finest race trails known to man. I race the races I can get to. I cried my eyes out two years ago when I blew the engine on our dog truck and I couldn't race the Limited North American. What are your strengths as a racer? Maybe one of my strengths as a racer is that I dont take myself so seriously. Even when Im racing my goal is to have fun. When I had the the best of the Frost/Lowry kennel I did pretty well at the races and it felt pretty good, but there was this niggling feeling in the back of my mind because I had dogs that I loved dearly back at home that didn't make the team and it just didn't feel right. So I've decided to forfeit winning in lieu of having fun and running the dogs I have. What do you consider your weaknesses, if any? I hate that. So now I try to slow down inside and let all that crap go. I likely wont be winning, but I'll enjoy the ride a whole lot more. Time will tell. Tim White says that if dog mushing gets into the Olympics it will likely be the 6-dog class! but Im not sure bigger IS better. Id like to work to find sponsorship dollars so that we can give away spay/neuter coupons as prizes at every dog mushing event. I think the future of our sport depends on responsible dog ownership and that includes curtailing the number of animals produced. There are too many people making money selling dogs. There are too many people making dogs for free. There are just too many dogs. I think the best we can all do is to teach by example. Dont say one thing and do another. New mushers often have fresh insights and new ideas. Id like them to share that with the rest of us! I think we could all network more and better and improve communication between mushers and clubs. I've seen some competition between distance and sprint, between skijoring and sleds. I think we all need to work together. Its the dogs that connect us all and they should be the driving force behind everything we do. 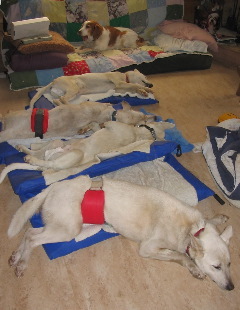 The dogs should come first and we should all work together to make sure they are safe and happy and well cared for. Without that, our sport is doomed.